Stampinantics: HAPPY NEW YEAR - 2016! Happy New Year to you all! I always feel that January 1st is the fastest day in the year to disappear and I don't normally achieve much. It takes a few days to register that the new year has begun, so I thought I would put my first post of the new year up today so I can say I actually achieved something! I recently had the pleasure of making a very special birthday card. It's not everyday I get to make a card for someone turning 100!! I certainly felt the pressure to make it special and memorable! One of the exciting new stamps in the Occasions Catalogue (you can begin ordering on the 5th of January!) is Rose Wonder. It was just perfect for my needs and I broke out the sponges and post-it notes to really give it some "wow". This wouldn't have been complete without a little bling and the new Blushing Bride Glimmer paper is divine! I also added a touch of Wink of Stella (hard to photograph) on the outer petals of the roses for a very subtle shine. So pretty! Just four more days until the new Occasions and Sale-A-Bration catalogues are released! If you are anything like me, you will want everything! I especially love it when I can get what I want at a discount. I can help you with that too! I am currently looking for people to join my team, Paper Diva's, the benefits are so worth it! If you live in NZ, email me for more information! 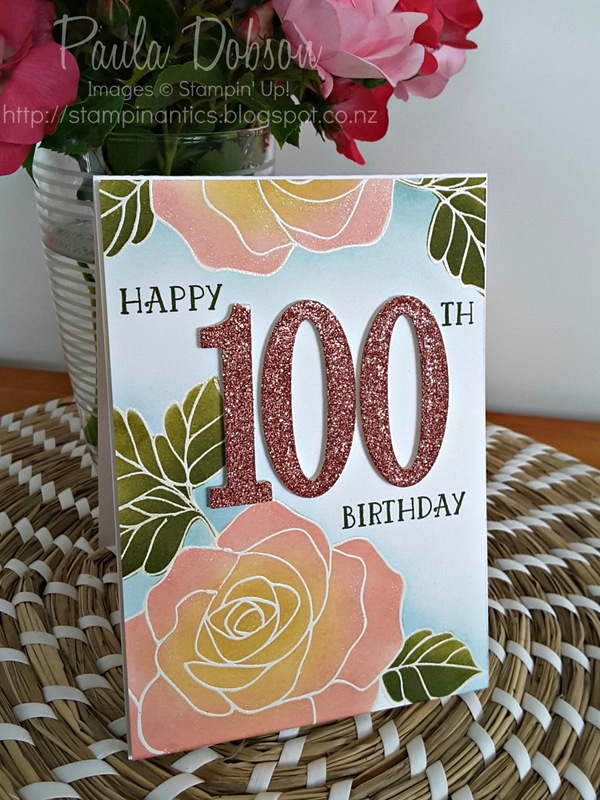 I would love to here how you made this lovely card.